Today is Tomb Sweeping Day. For the boys a day off school, for John a day off work and for me a day to sleep in! 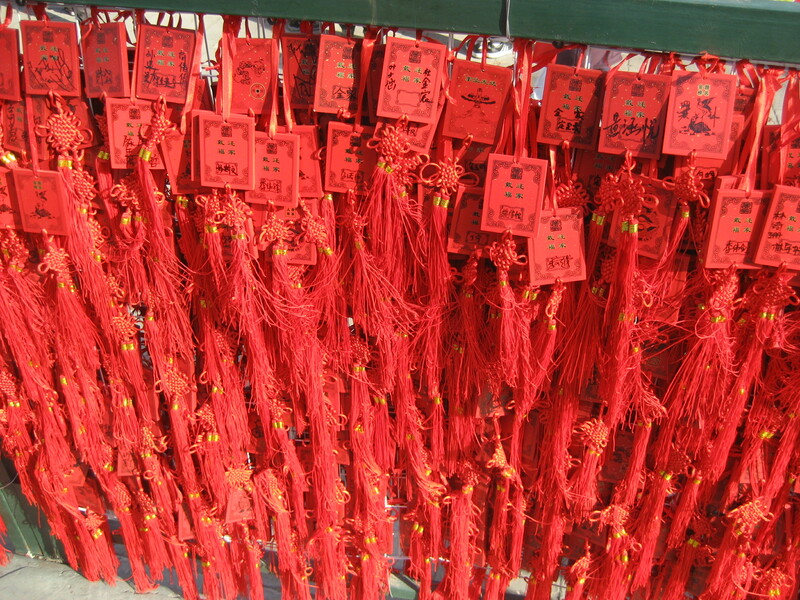 For traditional Chinese it is a day to visit the graves of ancestors and honour dead relatives. Historically, a rooster was brought to the tomb but now people bring favorite dishes. Tea, wine, chopsticks and paper copies of useful things like money are also offered. I am really becoming Chinese. I have been thinking about my parents so much today. I have been at the boy’s school everyday this past week watching soccer games, having parent teacher conferences and dropping off all sorts of forgotten homework, cleats and forms. The only thing that keeps me cheerful through all this is remembering how my parents came to every event I ever had. I wish I could tell them how grateful I am. Perhaps trying to be the same kind of parent they were is how I am honouring them. This is also the day to clean off all the winter’s dirt from the grave and get ready for spring. And spring is coming to Beijing. Our compound is surrounded by hundreds of trees, which are all starting to bloom. Beautiful pale green is everywhere. That said, I cannot figure how they will survive as there is no water. It hasn’t rained since October. This should be the most amazing time for walking, and Chowder and I are so keen. Stopping us is my new obsession… pollution. The American Embassy in Beijing monitors the air quality every hour. There is a scale: 0-50 is good, 51 – 100 are moderate, 101 – 150 is unhealthy for sensitive people, 151 -200 is unhealthy, and 201 – 300 is very unhealthy for everyone. Today was 378. Like an idiot I did yoga with the window open and nearly threw up, deep breathing is not a smart move. We had three days of over 600, right after Spring Festival. Everyone comes back to work and to Beijing after the 15-day holiday. We live outside the fifth ring road where people are still allowed to burn coal. That combined with all the factories restarting and all the cars returning to the road made for the worst pollution in 11 years. I could hardly breath and my eyes burned. You could feel grit on your teeth. The boys weren’t allowed outside for recess or sports. Collars and cuffs of shirts turn black by the end of the day. We use so much Spray & Wash trying to keep things white! Obviously, this is one of the downsides of living in what really is an amazing city. We made a substantial investment in air purifiers and thank goodness, they work! We now get at least 8 hours of clean air every night. 10 weeks we are back in Vancouver and are all looking forward to fresh, fresh, fresh air, inside and out! !